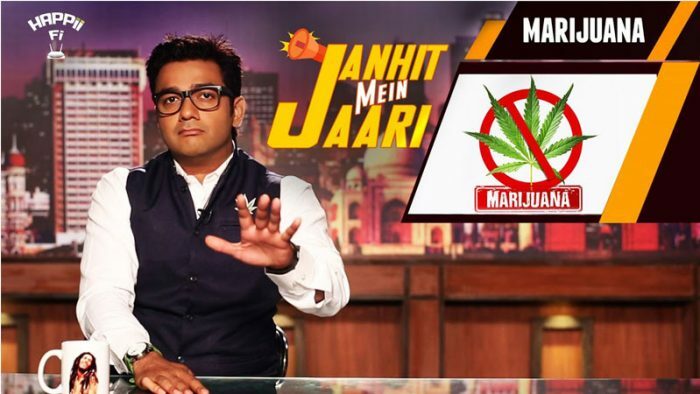 ‘Janhit Mein Jaari’ that translates to ‘Issued in Public Interest’ and compiling films around this concept, SABGROUP’s digital initiative Happii-Fi has released a web-series under the title, stirring stories coated with humor to inspire the society. Considering the currently chaotic scenario with misplaced ideologies in the society, organizations have come together to create content that can make a difference, this is one of those entertainment plus education series that touches upon issues that need to be addressed and spoken about. The first episode was titled ‘Indian Republic Day’ where they asked youngsters the reason for celebrating this day which most of them were unaware of. Then through the rest of the film it takes us through the fact how Republic Day is treated as a day for sales or a patriotic Bollywood movie, overall, touching upon the picture of our country around Republic Day. The second episode around Holi talks about marijuana in the country, the reason for its ban and the overall history around this substance, which most of us don’t know about. Keeping it topical and humorous, these films have caught momentum as the first one has already received 128,119 views and the second has 136,903 views on YouTube. These films are educative and are scripted with the motive of reaching out to the audience, to ignite a sense of responsibility and awareness among the citizens of this country. #AIBJagrata is all the entertainment you will need in the dead of the night!